As I started to share more of my healthy eating adventures here and on Twitter, it seems that I struck a spark with Weight Watchers themselves. Thanking me for my devotion to the company and a healthier lifestyle in general, they surprised me with something that I considered pretty darn cool: an invitation to watch a taping of ABC’s The Chew as Weight Watchers hosted a competition to find the “Weight Watchers Chef”. So exciting! The episode that I was at is AIRING TODAY at 1 p.m. EST on ABC, of course. And I can’t wait to see it! Though, admittedly, I’ll have to watch a taping after work. 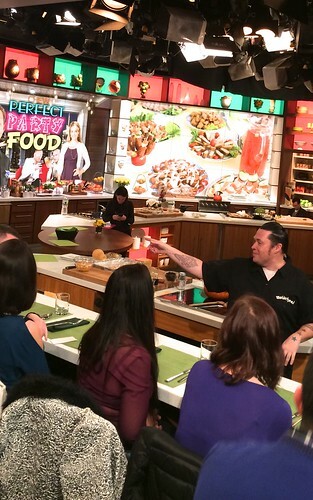 Still, it was a really fun episode focused on “Perfect Party Food”. The hosts presented a healthy version of chicken wings and a scrumptious cocktail–and then at the end we saw the last two people compete in round 1 of Weight Watchers’ search for their chef. I won’t tell you who won–or with what dish–but I can tell you that it all looked pretty freaking amazing. And both recipes that were shared were Weight Watchers-friendly and perfect for the big game day this Sunday! What more can anyone ask for, really? One of the most fun parts of watching a TV taping is seeing how things work behind-the-scenes. One of the things I found most surprising (but maybe I shouldn’t have) was that they actually have a professional stand-up comedian warm up the crowd in between takes. That’s him in the first photo and he was pretty hysterical. I was only sad that he never called on me! It was also fun to see the hosts’ interaction between takes. It turns out Carla is one GREAT dancer and Clinton is a big hugger. I can’t wait for the episode! In the meantime, check out more about The Search for the Weight Watchers Chef and, to my surprise, The Chew’s Latin Flavors Headquarters. Not all of the recipes they feature are healthy, of course, but it’s a good place to start–especially if you want some recipes from the stars! Personally, I’m looking forward to making Eva Longoria’s favorite Pineapple Upside Down Cake for a special treat. Perhaps I’ll make that one this Valentine’s Day–alongside my special healthy treat of fresh kale salad with queso blanco and another serving of my smoky three-bean chili. Sounds yummy! 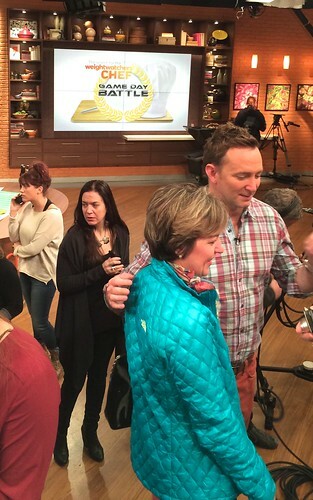 Will you watch as Weight Watchers searches for their chef on The Chew? This entry was posted in New York City, Weight Loss and tagged pineapple upside down cake, the chew, weight watchers by Irina Gonzalez. Bookmark the permalink.